1. Help unit leaders establish and maintain proper advancement procedures in their units. This is accomplished by working with the training committee in the advancement section of volunteer training courses and by working with the commissioner staff as they identify specific advancement needs and problems of individual Scout units. 2. Monitor rank advancement progress throughout the year. Identify those units with little or no advancement that may need special assistance. 3. 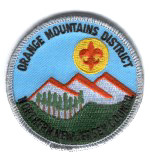 Manage merit badge counselor information. Recruit and train an adequate group of merit badge counselors. Publish a current list of merit badge counselors. 4. Review and approve Eagle Scout service projects plans. 5. Participate in boards of review. 6. Review appeals from Eagle Scout candidates. Consider and act on appeals from Eagle Scout candidates if their troop denies their application or turns them down at the board of review. 7. Recommend youth members or adult Scouters for special awards and recognition. 8. Provide physical facilities and experts in advancement fields that are difficult for units to secure.